You’ll work in one of our carefully selected training stores, where you’ll be exposed to all aspects of community pharmacy life. Helping patients get the most out of their medicines. Screening for Type 2 diabetes. Monitoring blood pressure and cholesterol levels. Providing expert advice on everything from stopping smoking to maintaining a healthy heart. You name it. There will also be opportunities for you to observe clinical services and to provide services to specialist patient groups including care homes, substance misuse clients, prisons and the Ministry of Defence. Throughout the programme, you’ll receive one-on-one support from amazing tutors, learn from highly skilled regional trainers, take part in off-site training days and complete monthly practice exam papers. 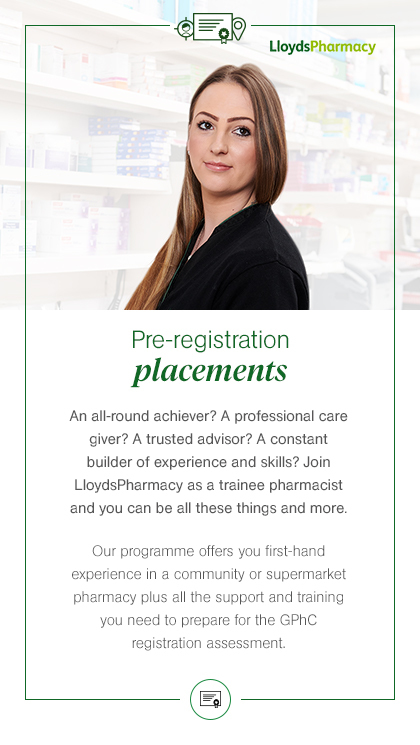 In short, you’ll have everything you need to prepare for your registration assessment and life as a pharmacist.